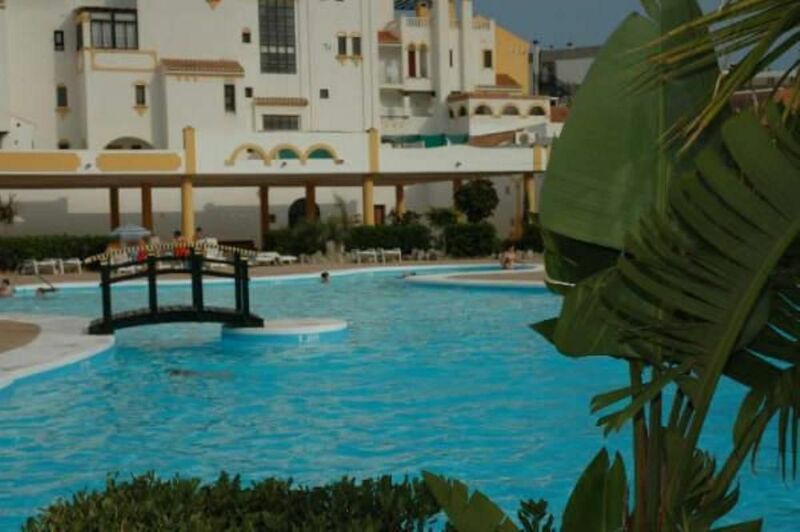 In a complex of singular architecture, with two swimming pools, green zones, to 50 meters of the marine stroll and the beach, in a zone with all class of commerce, pharmacy, restaurants, supermarkets, etc. Beach with blue flag, are of fine sand, with showers, hammocks, infantile park, monitoring, are an ideal place to rest without resigning to no comfort. The apartment consists of all the necessary one to live, has a dormitory with two beds of 105 cm. sofa bed in the hall, complete bath, cooks American, with household for four people, terrace with table and chairs, television, washing machine, refrigerator, vitroceramica, microwaves, toaster, coffee pot, iron, table to iron, dryer of hair, savannahs for all the beds, towels, etc. we close lived for the keys or emergencia that can appear. We live in the proximity, available 24 hours, 365 days a year. "Very nice stay at Roquetas de Mar. The owner was very kind and helpfull. Very close to the sea. Many places to eat in the direct surrounding. For trips you definitely need a car. The appartement was clean and well equiped. The view was nice enough. Although the swimmingpool was nog open through this time of year." Hemos tenido una estancia muy buena. El piso muy limpio, ordenado y acogedor con todo lo necesario para un hogar. Antonio el dueño de la casa, un hombre serio, responsable, comprometido y cercano. La hurbanización muy bonita y amplia a 3 minutos de la playa, muy limpia y bonita y muy comoda ya que es de piedrecitas y no se queda la arena en la ropa. Todo bastante bien y muy comodo, muchos restaurantes debajo de la casa con buenos precios y la comida bastante buena. La description de l'appartement est conforme à la réalité, de plus nous avons apprécié sa propreté. La résidence est calme et proche de toutes les commodités. Les propriétaires Antonio et Ana sont d'une extreme gentillesse, n'hésitez pas à leur demander des renseignements. De plus cette région est magnifique et les gens sont très gentils, cela change des autres villes touristiques de la côte méditerranéenne. "tous était très bien rein a dire sur l appartement mais fin septembre on na pus profiter des piscines"
Nuestra estancia ha sido realmente buena. El apartamento muy limpio, muy bien equipado y acondicionado. La situación muy buena, bien comunicado y todo lo necesario en cuanto a comercios y demás muy cerca de la casa.Muy buena playa a escasos metros de la playa. La urbanización muy bonita y limpia, con dos randes piscinas. los propietarios realmente encantadores y atentos. el año que viene repetimos. antonio es un propietario amble y atento con cualquier necesidad desde elmomento de ofrecer lainformacionhasta eldia de la despedia.son un encanto ely su mujer. El apartamento es estupendo fresco, comodo, todolimpio y muy cuidado.y la urbanizacion una delicia...lo quehemosdisfrutado de laspiscinas. Not difficult for her arrival. By car the Mediterranean motorway, exit to Roquetas de Mar, Almeria airport plane (35 km) and then by highway to Roquetas de Mar, is not lost. There are many things that to see, the natural place Entinas End, the old salt mines with birds, the marine and sport port of Roquetas, the Castle of Santa Ana, Alpujarras Almeriense and Granadina with its colorful towns of Arab remeniscencia, the Fortress of Almeria, the urbanizations of Aguadulce and Almerimar, in the East the natural park Cabo de Cat, the refuges of the Spanish civil war in Almeria, MiniHollywood and the desert in Taverns, the extraction of the marble in Macael, the troglodytic zone of the Millares (first settlers of Almeria), towns in the zone of Guadix, and as It Alhambra of Granada I do not complete redoubt of the Arabic in Spain, to 190Km in capital Granada. There is tourism office here where they informed to him into all the places of interest of the zone. prices are orientative, decreasing according to duration. tarifas decrecientes en función de la duración, entrega de llaves realizada por propietario .